A Los Angeles teenager has been arrested and a second plans to turn himself in after allegedly stealing some parts from the Porsche that “Fast & Furious” star Paul Walker was in when he died in a crash, authorities said. The two men allegedly stole wreckage from the 2005 Porsche Carrera GT as it was being towed away from the scene Saturday night after the crash, Sheriff’s Capt. Mike Parker told the Los Angeles Times. The investigation led detectives to Jameson Witty, 18, who was arrested at his home in Los Angeles and was being held on $20,000 bail, the Sheriff’s Department said in a statement. A second suspect, a 25-year-old man whose name has not been released, was outside California and arranging to surrender, according to the statement. “A witness saw a male exit a vehicle that was following the tow truck. The male grabbed a piece of the wrecked Porsche off the tow truck bed. The male drove away with the stolen vehicle part,” the statement said. Detectives identified the two suspects, and while serving a search warrant at a home in Canyon Country, a community north of Los Angeles, they found a red T-top roof panel from the Porsche, sheriff’s officials said. They would not say what led them to the two men or what evidence they had against them. Sheriff’s detectives planned to meet with prosecutors to discuss charges. It wasn’t clear if Witty has an attorney, and no phone listings for family or associates could be found. An Instagram account with the profile name “Jameson Witty” shows a picture of what appears to be a car part with the caption, “Piece of Paul walkers car, took it off a tow truck at a stop light,” TMZ.com reported. 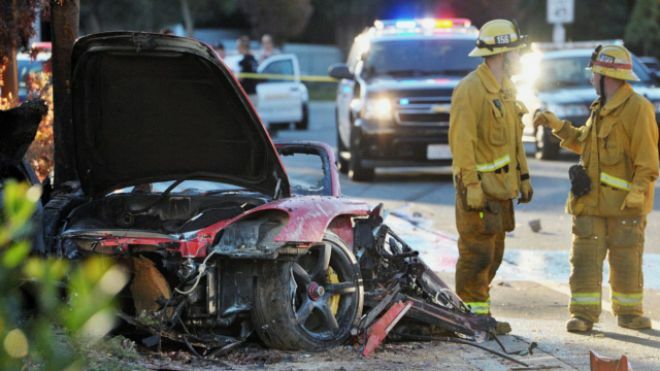 Walker, who starred in all but one of the six “Fast & Furious” blockbuster films that glorified fast cars and dangerous driving, was killed when the Porsche smashed into a light pole and tree then caught fire on Saturday afternoon, authorities said. The seventh installment of the movie series was on a break from shooting for the Thanksgiving holiday. The crash also killed friend Roger Rodas, who was driving the car. Sheriff’s investigators are still trying to determine what caused Rodas to careen out of control. Previous PostCalifornia dad, daughter sentenced in vigilante attackNext Post‘Family Guy’s’ Brian coming back in upcoming episode?